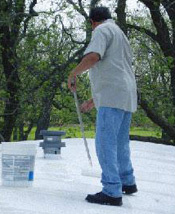 Roof Coatings are an important measure to take in properly sealing your home to protect it from the weather. Elastomeric roof coatings are a must and should be re-applied every four to five years to reduce air conditioning costs and significantly prolong your roof life. Pressure washing the roof before applying the coating is the proper procedure in sealing your roof, failing to do so will result in an ineffective roof coating causing roof leaks and pealing. So call us today to Receive a FREE Quote! It's not a question of if but when you will need our services, all mobile homes need to be adjusted after being setup for a period of time. 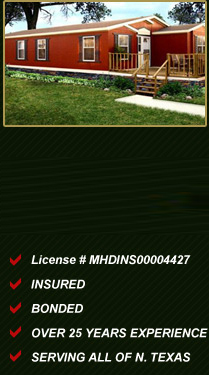 Our company is on the level and up to the task of correcting all of your leveling problems. The skirting we use on every job is top of the line and the new top-rail design resists warping and blowout. Pre-notched front top rails allow for expansion overlap and help reduce installation time. Removable-panel design lets you store garden tools, lawn furniture, and children's toys out of sight, but not out of reach. New panel profile adds strength and provides extra security against wind loads. Extra-wide, 16 inch panels mean fewer to cut which saves even more installation time. Unique design lets panels self adjust to ground-level fluctuations due to changes in weather conditions. Ventilated panels are required to help eliminate moisture buildup and allow for proper air circulation.